Take the e-mail test: Can collaboration tools save time and money? Every once in a while, you learn a thing or two from a fifth-grader. My 11-year-old son uses a Web-based e-mail account to chat with a few pals on the East Coast and a couple of out-of-town cousins. But you’d think he was friendless if you saw his inbox. There’s rarely anything in it. Of course, that’s not because he’s friendless. (He’s not.) It’s because he deletes his email messages as soon as he reads and responds. When I asked him why he never saves them, he simply responded: “I already read it. Why do I still need it? OK, maybe that same sort of 11-year-old reasoning doesn’t apply in business environments, where critical documents and information are often found in an e-mail message. But the basic idea is a good one: If you’re done with it, delete it. E-mail overload, though a problem for years, has always been a concern for the overwhelmed user. 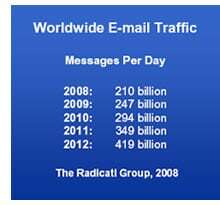 But even corporate networks can take a beating as the sheer volume of messages has increased. It’s not brain surgery; it makes perfect sense. But every once in a while, we need a kick in the pants to remind us how much of a time-waster e-mail can be and how to deal with it. Managing Tasks : Sending or getting tasks requests and updating status. You will find that close to half of the emails in our inbox don’t have much to do with “communication” at all, and fall in one of the above categories. Ironically, email is supposed to be a tool for “asynchronous communication”. A majority of emails are about teams and groups coordinating activities, discussing work related matters, or actually working on tasks like editing documents and sending them back and forth as attachments. Now, I feel bad for using e-mail earlier today to coordinate a time and place for an upcoming meeting. At least I refrained from sending that final “See ya then” mails.